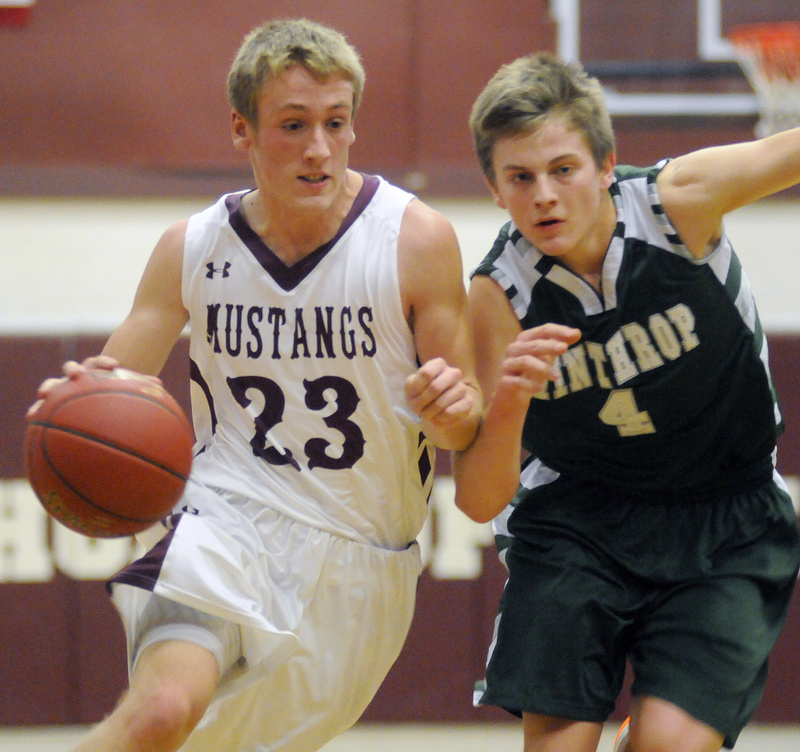 Mustangs playing competitive games despite 1-7 record. Wade Morrill knows the record. And the Monmouth boys basketball coach insists it doesn’t tell the story. The Mustangs are 1-7, ranked 15th out of 18 teams in Class C South, but Morrill said it’s the little things that are costing Monmouth on a nightly basis. A turnover here. A missed shot there. A defensive miscue or two, turning well-played, close games into frustrating losses. Staff file photo by Andy Molloy Monmouth's Hunter Richardson, left, tries to get by Winthrop's Spencer Steele in a game last season. Richardson and the Mustangs hope to get back on track after a slow start to the season. Monmouth may be on the upswing, having notched its first win by beating Dirigo on Wednesday after an 0-7 start, but it’s still been a surprising start for a team that finished 11-8 and made the playoffs last year and had all-Mountain Valley Conference pick Hunter Richardson leading a talented returning cast. The game-by-game story has told a more accurate story than the overall glance does. Monmouth has a blowout 93-58 loss to Winthrop, but the rest of the defeats have been games that the Mustangs were on the verge of winning. There’s a three-point loss to Carrabec. A four-point loss to Mountain Valley. Losses by six and seven points to Boothbay and Lisbon, respectively, and a two-point defeat against Oak Hill. It’s not even a half or a quarter that’s been getting away from the Mustangs, Morrill said. It’s been specific trips down the floor. There are a few culprits for the losses that have dogged Monmouth this season. On the defensive side, an Achilles injury to Nick Dovinsky has disrupted the Mustangs’ ability to play Morrill’s full-court, pressure-based defense. And on the offensive end, the shooting touch has been missing. While Morrill expects 45 percent shooting from the field and 75 percent shooting from the free-throw line, Monmouth entered the Dirigo game at 37 and 59 percent, respectively. The results haven’t robbed the Mustangs of their work ethic, Morrill said. But he acknowledged building frustration among the players. Fortunately, nothing is lost. The playoffs are still far enough away for Monmouth to make a move into contention if it can find those answers. The victory over Dirigo could be the first step. The schedule for Cony is about to get busy — against some of the better teams in Class A, no less. Starting Friday against Lawrence, the Rams play four games in nine nights. Hampden Academy is up next on Tuesday, followed by Gardiner on Thursday and Messalonskee on Saturday. Add in the make-up game that the Rams played against Oxford Hills on Wednesday, and it’s a stretch of five contests in 10 days. A stretch that coach T.J. Maines was less than thrilled about. The games were all pre-scheduled aside from the Oxford Hills game, a 64-49 Cony loss, and they’ll all be tests for a 3-4 Rams team looking to establish itself as a Class A contender. Hampden is undefeated at 7-0, and has already beaten Cony this year. Messalonskee (5-2) was the preseason Kennebec Valley Athletic Conference favorite. And Gardiner also scored an earlier win over Cony, winning 82-80 on a tip-in by Connor McGuire in the final seconds. Up next is 1-5 Lawrence, however, and Maines said he’s not looking beyond the Bulldogs to the top teams lying ahead. Two of the three unbeaten teams in Class C South will meet soon when Winthrop (6-0 entering Thursday) hosts Madison (6-0) on Tuesday. The game will be a matchup of high-scoring forwards, as Jacob Hickey and Mitch Jarvais are off to hot starts for the Ramblers and Bulldogs, respectively.